Today’s Star Wars: The Old Republic update is a Fan Friday, which I did not expect. Is it that time of the month already? It didn’t seem very long ago that we had the last Fan Friday, and it’s a little strange to think that the next one we get will be in the new year. If you really can’t wait for SWTOR, here’s a suggestion — start measuring time based on the Friday Updates schedule, then the days will just seem to zip by. Given all the Jedi impressions and Jedi-related interviews we had floating around this week, I also half-expected to see even more stuff about the Jedi today. I don’t know, the Bioware team strike me as folks who like to keep with a theme, after all. In any case, Darth Hater has provided an excellent round-up of all the information this week with their “Jedi Immersion Day” articles. I usually take all previews with a grain of salt (and that means both negative and positive ones) since they are still early in development, and impressions are very personal and subjective especially when it comes to starting areas, but I found DH’s hands-on write-ups to rival Massively’s in terms of level of detail and relevance to an MMO gamer. Even though I generally find it difficult to agree or disagree with someone else’s take until I get the opportunity to play a game for myself, I enjoyed reading a lot of these for their unique points-of-view or specific examples. Videos courtesy of Darth Hater. They have a lot more cool stuff on the Jedi, I highly recommend checking it all out. 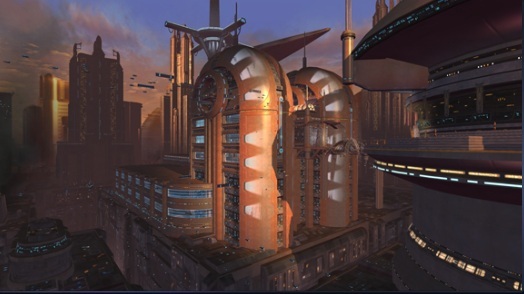 Back to the Friday Update, once again the Fan Friday came bundled with a Studio Insider and Community Q&A — this week’s developer goodie is titled “Experience Coruscant” and it’s a blog from World Designer Eric Young featuring an in depth look at the process of building the ecumenopolis. It’s hard to wrap my head around all the descriptions in his narrated tour, especially when all we’ve seen so far of Coruscant in-game are screenshots and a few short clips, and I will admit that all along I’d figured much of the city to be a “mere facade.” But no, apparently, the plans for Coruscant are much more ambitious. To make traversing a multi-level sci-fi city like this “seamless” and “immersive” sounds like a dream come true, and I really hope they pull it off. From the brightest lights to the darkest depths; such is the glory and tragedy of Coruscant. All of our planets have iconic musical themes as well as beautiful environmental art and effects, and even if a dirty cantina on Hutta isn’t beautiful, it sure feels like Star Wars to sit in one, listening to music and watching a creepy Rodian hit on a Twi’lek dancer. And finally, the first chapter of the upcoming Deceived novel is available for our reading pleasure, along with the second chapter on Starwars.com. Personally, I’m not going to read it because I don’t want to spoil it for myself. I’ll wait until March to read the entire thing, thanks, hopefully on my Kindle…but given the fact that the e-book version of Fatal Allliance is still not available for purchase, I’m not holding my damn breath. You are currently browsing the MMO Gamer Chick blog archives for the day Friday, December 17th, 2010.